Gulp....A number of people have asked me questions about this dyeing lark and I thought maybe I ought to do a post (another one I hear you mutter) in a tutorial sort of way. I hesitate because I'm no expert but just a mad woman who got hooked over the summer. So what I would like to do is share some of the knowldge I've accumulated, the suppliers I've used (sorry no web link to Mother Nature yet) and to tell you about the colours I got. First off, a WARNING. Natural dyeing is highly addictive. You will never look at a plant in the same way again and your friends and neighbours will start locking their garden gates. I've been dyeing wool blanket, undyed knitting wool which came from Texere Yarns (search for Pure New Wool) and fleece. I was lucky to find two local supplies of a Blue Faced Leicester cross and - hold your breath - a prize winning Cotswold. It's so important to have good quality raw material and fleece that you can actually spin. 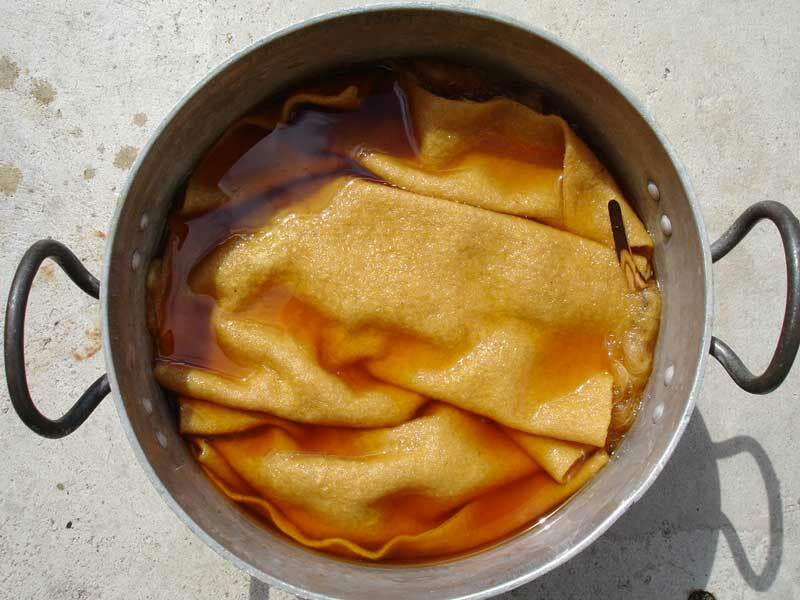 A mordant is something that helps fix the dye to the fibre and most dyers use Alum and Cream of Tartar. There are other mordants like copper and chrome but Alum is the safest. The recipe I've been using is 8% Alum, 7% Cream of Tartar to 100g of fibre. So for 500g you would take a pan of water and place it on your stove. Measure 40g of Alum into a cup and add boiling water. Stir and add to the pan on the stove. Measure 35g of CoT, add boiling water, stir and add to the pan too. Wet your fibres in the sink and add them to the pan on the stove before the water gets too warm. Bring up to a simmer and simmer for about an hour. Because my pan is usually stuffed full I tend to tip the whole lot out into the sink afterwards and leave for a few hours or overnight. That way I can make sure every inch is mordanted. If you take it out leave it to cool somewhere or it put straight into a hot dyepot. NEVER put the hot wool in cold water as it will shrink. 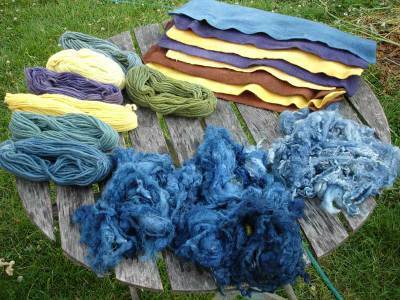 I bought some dyes from the lovely people at P&M Woolcraft and I used a lot of things from the fields and garden. The bought stuff was indigo, madder, weld, fustic, cutch and logwood. At this point I should mention that I used a couple of books as my guides and I urge you to do the same. Mine were Wild Colour by Jenny Dean and A Dyer's Manual by Jill Goodwin. The books will tell you how to use each dye and show you the range of colours you can get. Of the dyes from the hedgerows I used goldenrod, carrot tops, cherry bark and apple bark, walnuts, dahlias, almost dead hollyhocks, french marigolds, comfrey, blackberries and silver birch, and onion skins. Some things were a huge success, others a dissapointment, some surprises. I loved never knowing how something would turn out - after all you don't have a Dylon lid to show you. Sometimes you'd have the most lovely ruby red liquid from purple dahlias in the pot and you'd put in your wool and it would come out a bronzey gold colour. I gave up trying to get a green. You'd think that with all the green in nature that's the first colour you'd get but no Mother Earth doesn't give that to us so easily. 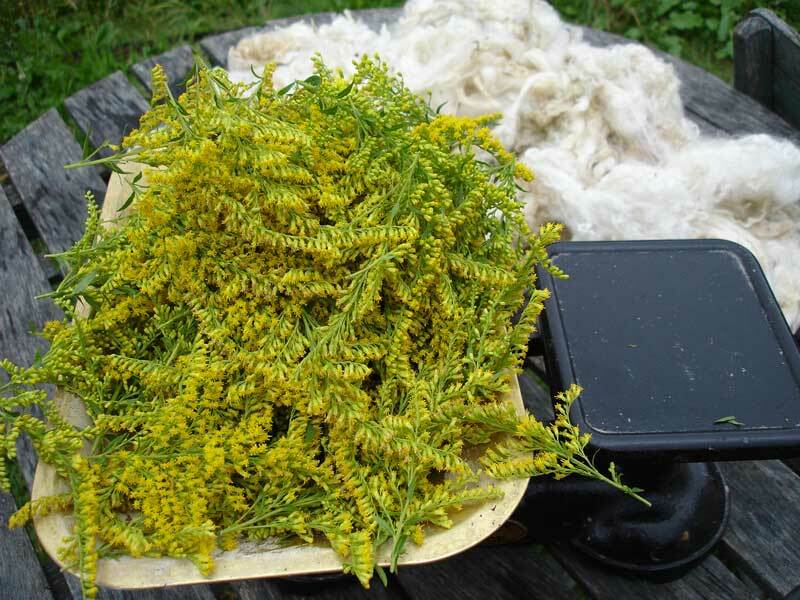 A good green can only be achieved by overdyeing a yellow with blue such as woad or indigo. In a nutshell, you basically extract the dye from the dyestuff by simmering it in water. Some things like bark need soaking for a few days, madder overnight but flowers are generally fine to use straight away. So you put your dye stuff in a pan and bring it up to a simmer. Then I usually cool the dyebath before I add the fibres. Unless ofcourse you have just mordanted and the fibres are hot too. You should really strain the dyebath before you add the fibres but I'm pretty slapdash and I seem to prefer to extract the pieces of bark or flower from the wool afterwards! I don't advise it. So you've put your wool in the dyebath and you simmer the whole lot for anything from 30 mins to an hour. I sometimes leave the whole lot in the pot to cool, sometimes take it out and leave it to cool on the table outside. Once cooled you'll need to rinse out the excess dye. Some people recommend a bit of white vinegar in the rinsing water. Whatever you chose rinse the wool well and hang out to dry. I'll just list some of the results because the pics can be found in previous posts and in my 'Natural Dyeing' photo album in the sidebar. 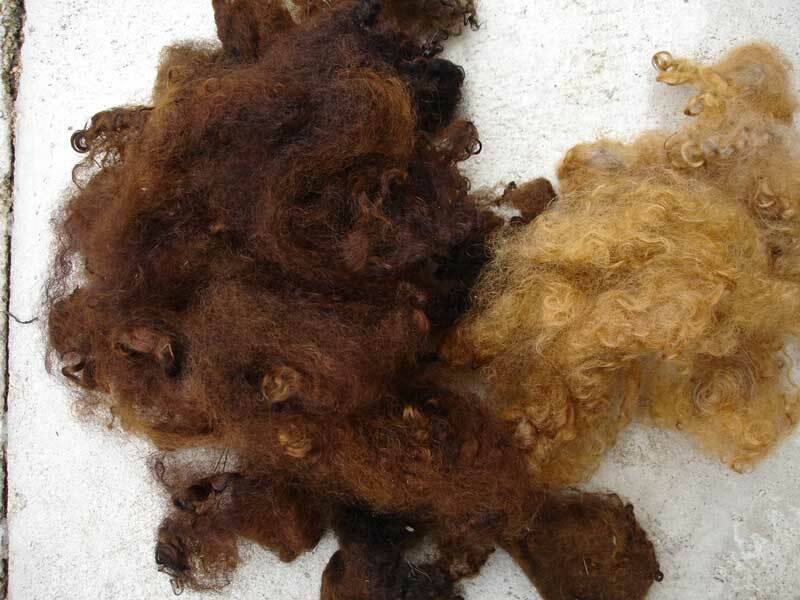 I must point out that all the fibres I used took up the dyes differently eg a blanket in apple or cherry bark produced a lovely deep fawn colour but the fleece was very light and not impressive at all. By the way apologies for not stating quantities I hardly weigh anything. Madder - I used 300g of madder to 400g of knitting wool. The books all said not to take the dyebath over 80C so I simmered the dye at that heat for an hour, strained the mixture, added the wool, simmered, took out the wool and added the dye again, simmered it again, added the wool again, simmered again. I repeated this about 4 times. I got a deep orangey colour but never the red I wanted. I've ordered some more dye to try again. After all this pallaver I added a tablespoon of citric acid granules (leftover from Elderflower Cordial making) and I dyed some fleece. It came out BRIGHT orange. Indigo - my favourite colour but you need a book to tell you what to do. Don't be put off by the instructions it's not difficult and definately worth it. Weld - produced a nice lemony yellow. Safflower - a deeper yellow. 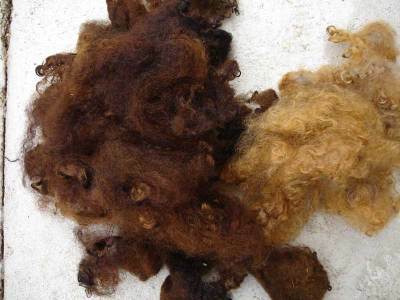 Cutch - a deep tan colour on blanket which went a gorgeous nutbrown after we added iron. However, the iron made the blanket quite rough to the touch - grrrr. Logwood - gorgeous deep purple colour on blankets and wool. Goldenrod - I used fresh flowers on fleece and blanket. Very nice yellow. Hoping to over dye with indigo to get green. 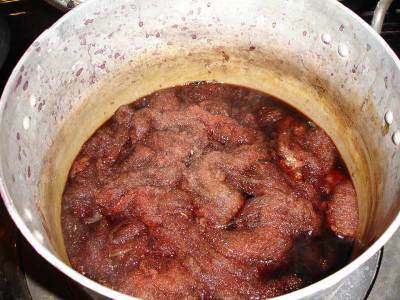 Apple and Cherry barks- soaked for about 5 days and then boiled up. Lovely fawn shade on blanket but dissapointing on fleece. Silver Birch leaves- very light greeny yellow. Comfrey- supposed to make a green according to the books but mine did nothing - just beige. Blackberries - boiled up in a pan and added fleece. Produced various shades of purple but apparently it will all fade to grey eventually. Carrot tops - very nice lemony yellow. French Marigolds - I only had about eight. Produced a lovely fresh yellow. Dahlias - used purple ones but they gave a bronzey gold colour. Onion skins - no mordant needed for these. Produced a bright, orangey yellow. Turmeric needs no mordant and produces a golden yellow and lovely green when overdyed with indigo. However, the books suggest mixing the turmeric with pomegranate rind to make it colour fast. Pomegranate. I just peeled it and boiled the rind. Turned the fleece a light yellow. 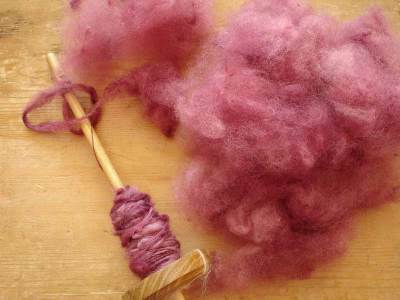 Cochineal needs a mordant and mine produced a deep pink. I dipped it briefly in logwood and it turned a lovely purpley colour. Brazilwood needs a mordant and it dyed my fleece a lovely deep pink. As it's also ph sensitive I put some wasjing soda in the pot and the fleece went purple. Must just share an experiment with you. I had a big dyeing mistake on some skeins of wool and I found a website telling me how to remove the colour from wool. So I followed the instructions using Thiox and washing soda - colour disappeared. Then I was supposed to neutralize the wool by soaking it in water and white vinegar. As the wool was hot and I was impatient I put the vinegar in hot, hot water and added my wool. It went a light greeny, aqua colour - eeek. Took it out quickly and hung it out. Then me gets thinking and I puts in my greeny fleece dyed with hollyhocks and it goes a nice sage green. I'm sure the thiox must have been spent by now so was it the washing soda that did it? Any chemists out there who can tell me? * It seems that Hollyhocks are ph sensitive and the washing soda is alkaline which means? I wish I'd paid more attention in Chemistry. I can't wait to see what you make with all this! Wow! I am so very impressed with your dying projects. You are so organized! And what lovely colors of yarn and wool you have to work with now. Thank you so much for posting all that information! fantastic! and congratulations, that has to be the biggest post, ever! and i did enjoy the no link to mother nature yet! SO interesting!! I love that rosy color on your spindle. And your blues are just lovely. Wow! what a great post! Really great information. It's all so fun to play with - don't you think? I like to make up a bunch of dyes and paint the rovings, then when you spin them, they're sort of varigated. Your pictures are so wonderful!! Great job! Brilliant, you did it! I'm deifinitely going to have a go at this now. I'll let you know how it goes! this is an awesome introduction into dyeing. I am having a go right now...with indigo...very complicated and I am such an impatient person. I hated chemistry at school...but if I had known that it could be useful for this kind of thing I may have paid more attention! And I'm awaiting your dyed wool I bought with great excitement...no idea what I'll use it for, but I will probably justt admire it for a while. I was happy to find this tutorial while searching for some clue as to how to dye with pomegranate. So glad you wrote up your little intro! i was just looking at those very same books that you have listed over there about natural dyeing and this tutorial is a perfect intro for me. when the weather gets nice i'm hoping to get to play with natural dyeing. thanks for sharing this tutorial. This is a wonderful resource. I've always been suspcious of dyes, but you've shown us that it's possible to create beautiful color naturally. Thank you! Congratulations and thanksgiving too, because i was dyeng with pomegranade, onions leaves , and other , I was obtained good resuls with them, but i can´t get green color.In your blog I was learning so much about this topics. Madder is sensitive to heat. There was an article many years ago in Spinoff about doing a long cold mordant in alum (I believe it sits for a month.) The dyepot is kept a bit under 100 degrees F. The long dye times gave a dark ruby color. I'll try to keep track of your blog and will post more details when I find the article this weekend. I've always wanted to pull those lovely red colors out of madder. Why red colour after time migrates from madder? Could you give me some recipe how to achieve good fixation, better lightfastness and rubbing? Please visit our web site for silk scarves for natural dyeing. I too had wool 'Tango'd' by soaked/dried madder roots. (Madder extract produces a fine terracotta red with a tinge of purple if you use exceptionally hard water....I made sure mine was.) My latest experiment is with ivy berries which produced a disappoint greige at first then a lovely grey/green. Loved reading about your naturl dyeing results. Your 'tutorial' is delightful. I am completely new to this process and was looking for information to help me dye a jumper. It is made from hand-spun wool and has already been dyed yellow with onion skins. I would like to change this to brown or green using natural dyes and wonder how to go about it. All books seem to specify boiling the wool and I am concerned that this would shrink, felt or spoil the jumper. Any advice you could offer would be much appreciated. Thank-you! I found your blog when searching for images of dandelion-root dyed yarn. I was going to subscribe to your feed and noted you said you wouldn't be posting any more, too bad this is a very helpful post. I'm going to bookmark your blog and come back. By chance are you a fan of Mary Jane Butter's Farmgirls? From the titles of some of your posts you would fit right in. i left it to sit overnight and then washed out. very pretty. very easy.